description for "Floribundas: Rose, 'Easy Does It' (tm)"
'Easy Does It' (cv. HARpageant) PPAF is the one & only AARS award winner granted for 2010â€¦itâ€™s distinctively delightful. Gorgeous colors of mango orange, peach pink & ripe apricot bounce off the mirrored glossy green leaves, providing a flamboyant fruit salad for the landscape. The free-flowing swirling shades of sunset of 'Easy Does It' show up in fragrant large colorful clusters atop a rounded bushy plant. So disease resistant, vigorous, flowerful & fabulous, you just canâ€™t say â€˜noâ€™ to this seductress of the garden. Moderately fruity fragrance. 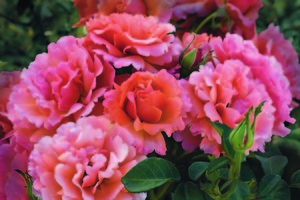 Blooms are medium large, double and ruffled. Photo by Gene Sasse (c) 2008 used courtesy of Weeks Roses. reviews for "Floribundas: Rose, 'Easy Does It' (tm)"